'Microphysicalism', the view that whole objects behave the way they do in virtue of the behaviour of their constituent parts, is an influential contemporary view with a long philosophical and scientific heritage. 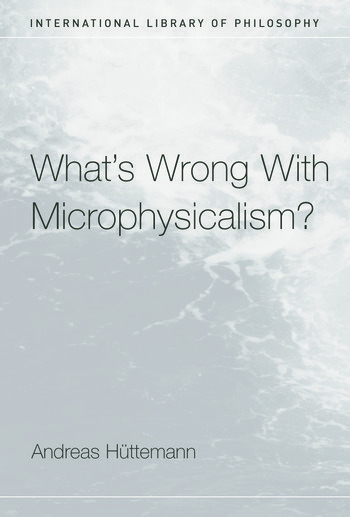 In What's Wrong With Microphysicalism? Andreas Hüttemann offers a fresh challenge to this view. Hüttemann agrees with the microphysicalists that we can explain compound systems by explaining their parts, but claims that this does not entail a fundamentalism that gives hegemony to the micro-level. At most, it shows that there is a relationship of determination between parts and wholes, but there is no justification for taking this relationship to be asymmetrical rather than one of mutual dependence. Hüttemann argues that if this is the case, then microphysicalists have no right to claim that the micro-level is the ultimate agent: neither the parts nor the whole have 'ontological priority'. Hüttemann advocates a pragmatic pluralism, allowing for different ways to describe nature. What's Wrong With Microphysicalism? is a convincing and original contribution to central issues in contemporary philosophy of mind, philosophy of science and metaphysics. Andreas Hüttemann is Assistant Professor of Philosophy at the University of Bielefeld, Germany.